Recognizing a growing need to unite the advocates, partners and supporters of national parks in advance of the upcoming 2016 National Park Service (NPS) centennial and beyond, the most diverse group of national park leaders ever convened gathered last week in Washington, D.C. to attend America’s Summit on National Parks. The Summit was a first of its kind event established in coordination with the NPS through a partnership of the National Park Foundation (NPF), the National Parks Conservation Association (NPCA), and the National Park Hospitality Association (NPHA). The two-day Summit, which took place January 24-26, was inspired by NPS’ recent Call to Action report [PDF download] and was designed to create unifying, clear objectives that will ensure the protection, enhancement, and support America’s iconic landmarks for centuries to come. The Summit inspired thought-provoking dialogue on some of the greatest challenges and opportunities facing national parks currently. The Summit produced a working document outlining the participants’ shared “Statement of Principles” and “Action Items” to ensure that the seeds of progress begun from the passionate and inspired conversations will take root, leading to growth, change, increased accessibility and ultimate strengthening of the national park system and national park programs. The Summit drew prominent members of Congress, Interior Secretary Ken Salazar, major political advisors and top conservation, tourism and communication leaders. 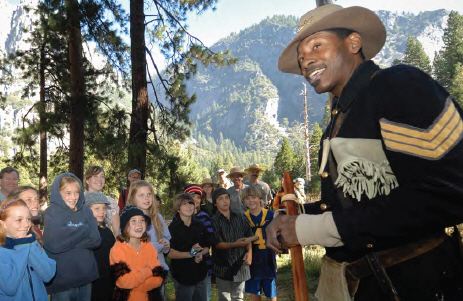 Among the most notable directives coming out of the Summit were to increase outreach to youth and other diverse populations; to make units within the NPS system more representative of the diverse makeup of the nation; to use technology, such as social media, smart phone applications, video games and other electronic technologies to attract visitors and improve park experiences; to highlight healthy food and opportunities for safe, active fun during park visits; to increase public awareness of the 2016 centennial; to create an endowment to provide the NPS with secure funding for the future; to encourage supporters and lovers of national parks to become more engaged with their members of Congress and other decision makers, and to grow the base of support for national parks, particularly among the health, education and tourism communities. Leading up to the 2016 centennial, the current stewards of our national parks will take up the gauntlet thrown by this Summit. Through their work, these original goals will be enhanced and the shared vision will become action. For more information about the Call to Action, click here. Anything we can do to protect our precious parks, I am for. this has been a good thing. I hope that they will also emphasize protection of the ecology that surrounds the parks and without which the parks cannot exist. I’ve pushed for more attention for the surrounding areas for years, but that’s definitely a mixed bag of jurisdictions. At least people are actively talking about making the parks better.